Windows 10 isn't the only big deal happening in the world of computers these days. 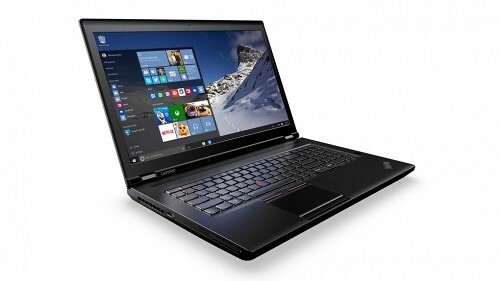 You've likely heard of the new Intel Skylake platform by now and the new Lenovo ThinkPads are totally taking advantage of the new technology by loading up with all sorts of incredible high-end specs. Want up to 64GB of RAM, the most of any mobile workstation? Want not one, but two USB Type-C Thunderbolt 3 ports to transfer gobs of data at super fast speeds? The new Lenovo ThinkPads have got that too. You have to remember that these are professional-class Xeon processors that take advantage of the new Intel Skylake architecture. They use the same 14nm process as Broadwell, but they've been built for even bigger performance. This is true for both the 15.6-inch ThinkPad P50 shown above and the even beefier 17-inch ThinkPad P70 shown below. In addition to the new processors, massive RAM, and pair of Thunderbolt 3 ports, these new Lenovo ThinkPads can also be configured with up to a 1TB SSD and with a 4K display, including touch support for Windows 10. If you really want, you can even get the P50 and P70 with Windows 7 or Windows 8.1, as well as with Ubuntu. Just don't expect either rig to be particular slim and lightweight; the P50 is 5.6 pounds and the P70 is 7.6 pounds. And no, it's not going to be lightweight on your corporate credit card either. The ThinkPad P50 and P70 have prices starting at $1,599 and $1,999 for the base configurations, but the price inflates substantially as you spec it up. Expect both notebooks to ship in Q4.